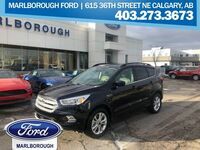 In the burgeoning small crossover segment, Calgary-area consumers have a multitude of choices, but a model that stands out from the pack is the 2018 Ford Escape. 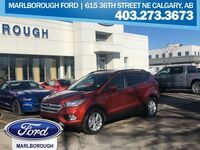 With it combining the utility of a larger SUV with the handling of a sedan, along with its wide array of advanced technologies and premium features, there's much to like about the new Escape. Come take it for a test drive at Marlborough Ford! The Escape is one of the best-selling vehicles in its class, and it's easy to see why with the endless list of desirable standard features that it offers. This includes 12-volt powerpoints, LED taillights, power sideview mirrors with integrated blind spot monitors, steering wheel-mounted cruise control, SecuriLock Passive Anti-Theft System, illuminated entry system and SYNC infotainment system with 4.2-inch color LCD screen. Available features in the 2018 Escape include power panoramic Vista Roof with power shade, remote start system, voice-activated navigation system and SYNC 3 with eight-inch color LCD capacitive touchscreen, AppLink and 911 Assist. With the 2018 Escape, you get the best of both worlds, for it offers the utility of a SUV, but handles the curves and corners like a sedan. This in part can be credited to the Escape's Curve Control and Torque Vectoring Control systems. Curve Control slows the vehicle down using throttle reduction and anti-lock braking when it senses that you're going too fast, while Torque Vectoring Control reduces understeer and forces the front end to hug the inside of the curve by transferring torque to the wheels that have the most grip. The new Escape also comes with AdvanceTrac with Roll Stability Control, which helps you maintain control whenever it detects wheelslip, understeer, oversteer or roll motion. Buyers of the 2018 Escape have a choice of three advanced powertrains: the 165-hp 2.5L I-4 with intake variable cam timing, the 1.5L EcoBoost for balanced power and efficiency, and the 245-hp 2.0L EcoBoost with Twin-Scroll technology for quick torque delivery. The new Escape also offers off-road capabilities with its available Intelligent 4WD System, which transfers torque from the front wheels to the rear wheels as needed to ensure optimum handling and traction at all times. Also, if you have a trailer or boat to tow, the Escape Titanium has a maximum towing capacity of 3,500 lbs. when equipped with the 2.0L EcoBoost Class II Trailer Tow Package. If you're interested in finding out more information about the 2018 Escape, then don't hesitate to contact us at Marlborough Ford!